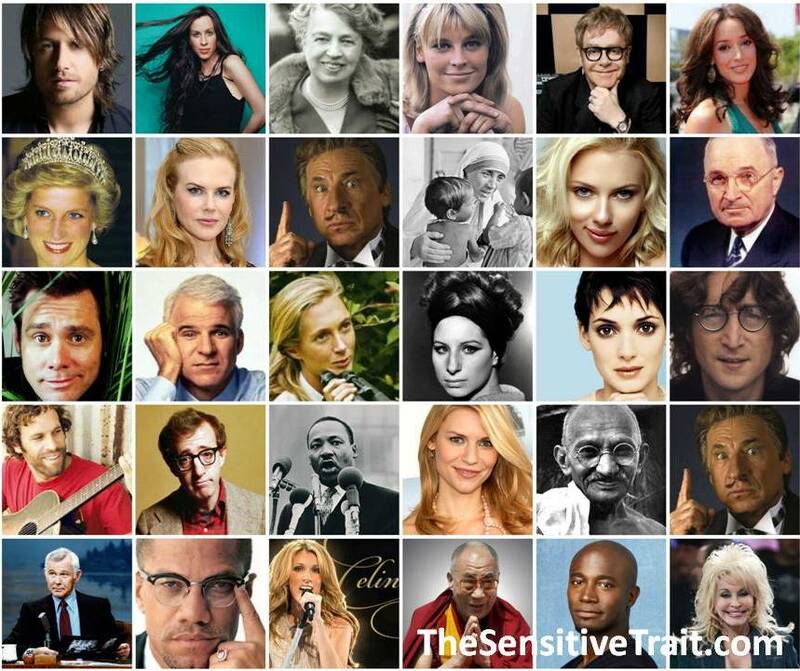 Highly Sensitive Famous People: There are more than you think! In an article written by Jim Hallowes, the founder of http://www.highlysensitivepeople.com, these famous leaders and revolutionists are noted as having highly sensitive characteristics; take a look at some of these names! Abraham Lincoln, Harry S. Truman, Martin Luther King, Jr. Malcolm X, Gandhi, Dalai Lama, Mother Theresa, Elenor Rosavelt, Princess Dianna, Sir Issac Newton, Thomas Alva Edison and Jane Goodall. These famous leaders are admired and recognized as leading through caring for humanity, positive change movements, and self-discovery practices – all things that HSPs are naturally good at. Famous HSP comedians include: Woody Allen, Jim Carey, Steve Martin, Mel brooks, and Johnny Carson (he was actually very quiet and shy off stage). HSPs are artistic by nature, and they have passion; I love that a lot of us are hilarious! “I found films to be turbulent and stressful. They have caused me an enormous amount of anxiety, because I do not have a lot of confidence. You are working, intellectually and mentally, and you are having to be with people and socialize all the time. “I did not perform well socially in junior high. I was a strange girl and I was in a lot of pain because of that. Famous HSP singers/songwriters and performers include: Bob Dylan, John Lennon, Elton Jon, Alanis Morissette, Neil young, Jim Morison, Celine Dion, Jewel, Keith Urban, Jack Johnson, Dolly Parton, and Barbra Streisand…way back to Mozzart. As I grow and become more aware of the HSP trait in myself and others, I find myself thinking about HSPs around the world and all of the dynamic situations that they live in. When my mind drifts to pop culture and the film industry, I find myself fascinated as I think about how many of them must be HSPs given their deep, beautiful lyrics, energy and connection with crowds as they perform, and their dramatic display of emotions on the screen. Imagine their lives, especially if they don’t fully understand what being an HSP means! Maybe they’re young up-and-coming stars in their teens and 20s… introverts even. Regular life as an HSP already has its obstacles with overstimulation and the need for downtime, let alone being in demand by thousands of fans every day. I think that famous people, more than anyone should be well educated on their HSP trait. I can’t help but think this is why some of them turn to drugs and alcohol as an escape, and as a way of coping with the world coming at them twenty-thousand miles an hour, 24/7, 7 days a week. These are the things I think about as I listen to and watch my favorite famous artists. Edgar Allen Poe, Ralph Waldo Emmerson, Emily Dickenson, Virginia Wolf, E.E. Cummings, James Baldwin, Walt Whitmen and Robert Frost, to name a few. And I am POSITIVE that there are many more famous authors, singers, actors and leaders in the world who are HSPs. What other famous people do you think are HSPs? There must be so many who haven’t come forth about it. Share some names in a comments below, or on The Sensitive Trait’s Facebook page! Here is my List – as I am German there may be some People you don’t know… This List I have copied from my HS-Blog. Don’t forget all the playmakers in Football/Soccer, like Neymar from brazil. Or other Sports People. Have fun! Wow thanks for your list Julia! There are sooo many well know HSPs! I love this! Hi Melissa, thank you for the comment – this is a great post that you did, we both experienced our life change when we found out that we were HSPs 🙂 – keep in touch!